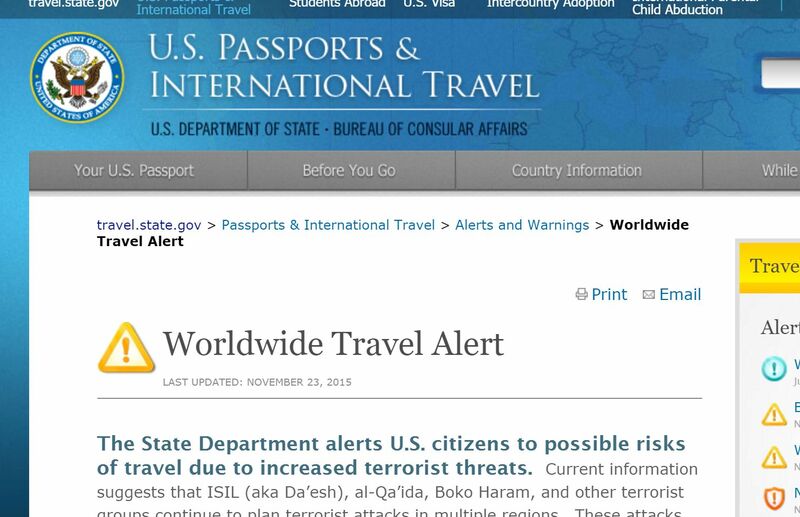 The “media” (rather than actual news) is all over the US State Departments general, extended travel warning. The warning is pretty useless, anyone paying attention should have assumed most of this already. Despite the worldwide spying, intelligence, phone hacking, the NSA has carried out, this is the best they can come up with? At the same time governments are using this as a reason to demand more intrusive technology, and less privacy for us. Remember, the French bombers did not use encryption… yet the cries to break or insert back doors into encryption grow daily. I’m travelling anyway… If two planes get blown up, or 100 Americans killed, that would be terrible, but you are still more likely to die of heart disease or a traffic accident, or shot by a white guy with a legal gun in the cinema or at a school. The fact that 100,000 people every year are wounded or killed in America by guns every year, puts the Paris tragedy into context. The worst thing about these vague, generalized threats is they are being used as a justification for more war, even boots on the ground. There is no easy answer, but lets remember that the middle east is a western created mess going back over 100-years. The US never really fixed Korea, or Vietnam, or for that matter Afghanistan. The memorial wall for the Vietnam soldiers alone killed in action contains some 58,000 names. Does anyone really think that letting in Syrian Refugees in would cost 58,000 lives? If you have kids, are you willing to let your kids be part of the draft? It’s impossible to imagine we can fix the Middle East by bombing alone. [See this, and this]. Remember, if you have NOT been protesting the bombing done in our names, you have no right to protest the refugees. Them being the war mongering American politicians, and ISIS.